My daughter LOVES StarFall! Starfall.com is a FREE website that teaches children how to read and write. When I first heard about Starfall my daughter was 2 ½ years old. 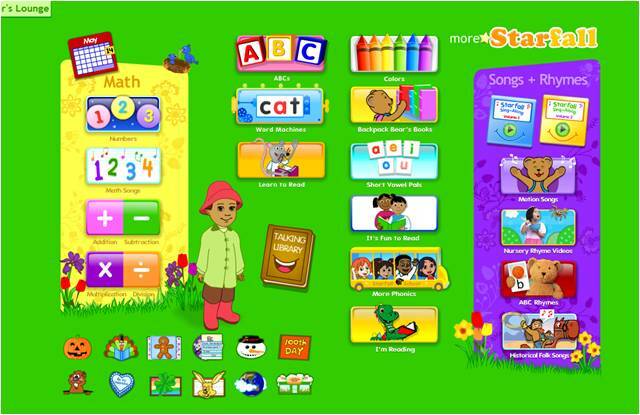 After introducing Starfall to her she quickly learned her alphabet and letter sounds. This website is so FuN and EnGaginG that children don’t realize they are learning! Starfall recently added an extended version to their website. Spend $35 and receive a 1-year membership that will include math songs, colors, nursery rhyme videos and much more! We purchased the membership and our whole family loves it. I try to sit down with Leanne when she wants to get on Starfall so we can share in the activities together. What a great way to INTERACT and help your child LEARN! At the VERY least, try out the FREE version and share this wonderful website with others!